I don’t get out of the preserve often, and that is for the best. The rest of the world is so confusing sometimes. We (the Warden, Ken, and I) went to some “gate” in the South yesterday. It looked more like a shopping plaza. Didn’t stay long, but we had to pick up a cake. 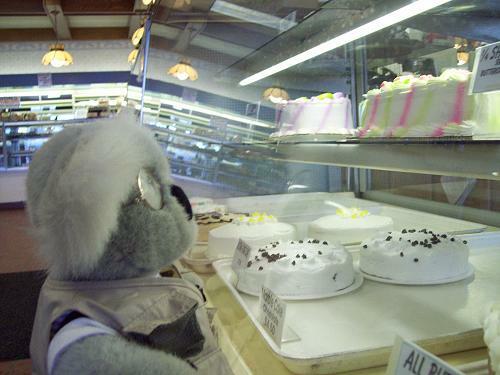 In the wild, or at least at the preserve, cakes live solitary and choose a cold environment for some sort of hibernation. This protects them from predators, usually human, who will slice them up and eat them if they leave their hibernation state for too long. Oddly, they tend to be consumed AFTER their predators have already eaten other things. And once the feeding begins, they move rather quickly, whereas they are otherwise describable only as dormant. But this environment is a cake paradise. They live communally in great numbers here. The whole environment is in some sort of impending micro-climate ice age, and they are so comfortable, they even have name tags or plaques for their respective spaces, unafraid and unaware of their brothers’ plight in warmer environs. We picked one out to bring back to the preserve, but I fear that it will end up like so many others. Even if hidden from view, Ken and the Warden cannot help but show them off to visitors. And then the frenzy begins. Not the prettiest sight.